It’s no secret that it’s becoming harder and harder to find a place to smoke. Smoking bans have forced us out of offices, restaurants, and bars, and smoking bans now target outdoor areas, multi-unit apartment buildings, and even cars. Smoking ban advocates claim their concern is protecting people from exposure to secondhand smoke. So they shouldn’t object to people smoking in a cigar shop, right? After all, no one enters their local brick and mortar because they don’t want to be around smoke; they go there to enjoy cigars and hang out with fellow smokers. Those who work in cigar shops do so because they are passionate about cigars, and often the B&M is the only place they can smoke while at work. But as you might guess, it isn’t that simple when it comes to the anti-smoking zealots. Instead, the last havens of cigar smokers are under siege, just like so many other places. But bans aren’t the only foes of cigar stores. Even where smoking is allowed, regulations are designed to do harm. In New York City, for example, the century-old Barclay Rex cigar store recently found itself in trouble with city inspectors who cited the shop for serving free coffee to its customers using a $9,000 automatic espresso maker. The violation was for serving “food” without a permit. Problem is, according to New York’s strict smoking ban, no place that allows smoking can have such a permit. Other shops in New York have had similar problems. When Nat Sherman launched it’s new flagship store in Midtown, it opened a downstairs members-only lounge, complete with a full bar. But during my last visit I was told that the bar was temporarily closed while they waited for the appropriate approval from city authorities. Free coffee and water were provided, so don’t tell the city officials. These are just some of the ways cigar shops are being targeted. Unlike online retailers, who can pick their base of operations to minimize taxes, local shops can be instantly driven out of business by massive tobacco tax hikes or complete bans. 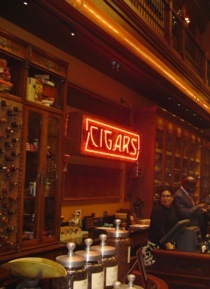 The shame of it is that cigar stores are the lifeblood of cigar culture. They’re where we go to sample new cigars, get recommendations about what to try, and enjoy the camaraderie of our fellow smokers. That’s why it’s so critical that we support our local B&Ms and defend them against these attacks. Realistically, there is no "common sense" reason to ban smoking in cigar bars, hookah lounges, etc. There are no kids or non-smokers to protect. So, the real agenda of the anti-smoking Nazis is revealed: control. I rarely if ever order online or from big box type cigar outlets for this reason. I always patronize small tobacconists. I have found that even when smoking in a designated area, there are still those that want to ridicule you. Last night, my friend and I were enjoying half price scotch and a cigar in a local tavern's outdoor seating area. A passerby mockingly told us how classy we looked and that we'd look real cool when we had cancer in 5 years. Can't people just mind their own business and let me enjoy the few areas left where cigars are allowed? For those of you in the mid-Atlantic: Speaking of supporting local B&Ms, be sure to check out Bethesda Tobacco in Maryland. Nice selection, great environment, and the proprietor, Mike Copperman, is very personable and knowledgeable. Patrick S, a few reps from others in the online cigar community, and I spent some time there on Sunday–highly recommended. I'll give a shout out to McCranie's in Charlotte, Georgetown Tobacco in DC, John B. Hayes in Fairfax, Dad's Smoke Shop in Cleveland, Iwan Ries in Chicago, and Churchill's and Smoky's in Southeast Michigan as a few of my favorites that still know what a good tobacconist and cigar shop should be. And what the 99 million dollars was going to. Note on page seven the "inside -out", provision going for patios later, AFTER business owners spend thousands of dollars to accommodate their smoking customers, clearly showing that the tobacco control activists have ABSOLUTLY NO CONCERN about local issues or businesses. Here's the "model ban" from page eight that many communities copied, printed, and passed. It's the "smoking ban for dummies" It only takes a few minutes to fill in the blanks naming your community, the administrators names, and blanks to customize it to your community according to the width of your sidewalks, so it looks like local leaders worked tirelessly for extended time to originate it. And an informal description of the handbook rules. thank god i still can enjoy my cigar at LCDH here in Abu Dhabi. But many great places got banned too. I think this isn't an issue of who is in the White House – a republican or a democrat. This is, as usual, about money. I would even venture to suggest that it has nothing to do with health or second-hand smoke. Lots of people stand to gain to raise taxes on us from demonizing us in the eyes of the general public. rosomax hit it right on the head! This is a way for politicians in general, to have a seemingly endless supply of tax revenue.